Raleigh’s Top Choice for Alternator Repair and Replacement for All Brands Including: Mercedes, BMW, Audi, Porsche, Land Rover, Mini, Volvo, VW, Lexus and Toyota. It’s like a dealership at your location but affordable. Are you looking for an honest, trustworthy, and ASE certified mobile mechanic in Raleigh to perform alternator repairs or alternator replacement? If you are experiencing issues with your vehicle’s charging system, Proficient Auto can help. We are the most convenient and affordable mobile mechanics without sacrificing quality. With free quotes, excellent customer service, and warrantied parts, we are Raleigh’s Top Choice for alternator repair and replacement. What are some signs you may need a new alternator? Dim Lights – Your alternator is part of the vehicle’s electrical system, so a failing alternator may produce electrical issues such as dim lights, power windows not working, or power seats working slowly. Weak or Dead Battery – A quick test to find out if it is your car battery or your alternator is to fully charge your battery. If you vehicle has difficulty starting after a fully charged battery, the issue is likely a bad alternator. Weird Smells – This may sound odd, but your alternator works with a system of belts in the vehicle. If a belt is not turning properly, it causes friction resulting in the rubber heating and that “burning rubber” smell. A quick fix to this would be tightening your belt. If this does not solve your problem, it may be a sign you need to have your alternator checked. So, now that you have an idea of some common signs of alternator issues, what services can you expect from Proficient Auto? Hassle free alternator repairs and replacements with peace of mind at your home or office. For a more comprehensive list of our alternator repair and replacement services, or to get your free quote, please call us today at (919) 675-2886. 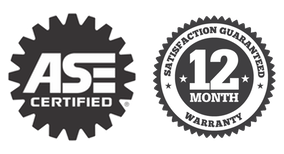 In addition to the convenient and friendly service from our ASE Certified Mobile Mechanics, you can expect a 12 month or 12,000 mile warranty on all parts provided by Raleigh Vehicle Repair. We look forward to working with you and creating a long-lasting relationship. Thank you Eric for finding Jason to do my car putting an alternator in at my house he did a great job this place is awesome and I will use them again hopefully not too soon LOL I would recommend this to all my friends thanks again.